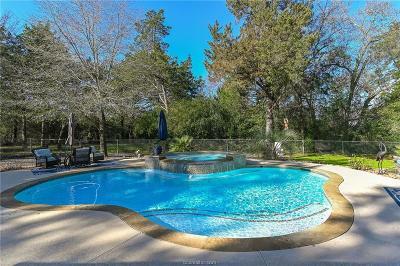 This country paradise with a gorgeous custom pool is nestled on 5 idyllically secluded acres near Wheelock, TX, close to B/CS. The 2017 High Tech heated pool with 10 person hot tub is the crown jewel of this manicured estate. Enjoy the delightful 2018 renovated gourmet kitchen with quartz counter tops and kitchen island with eating bar. LED lighting. It boasts a 5 burner gas range/convection oven and electric convection oven. The house has received extensive renovations. PVC waterproof flooring, new stone and mantel around fireplace and much more. Outdoor walking trails. 30 x 30 concrete slab shop with rollup doors. New gravel Drive and extensive landscaping, custom flagstone and fountain.